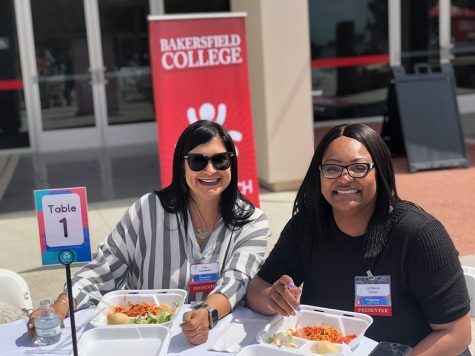 The fall semester is in full swing and students of Bakersfield College are in full need of supplies for their new classes. 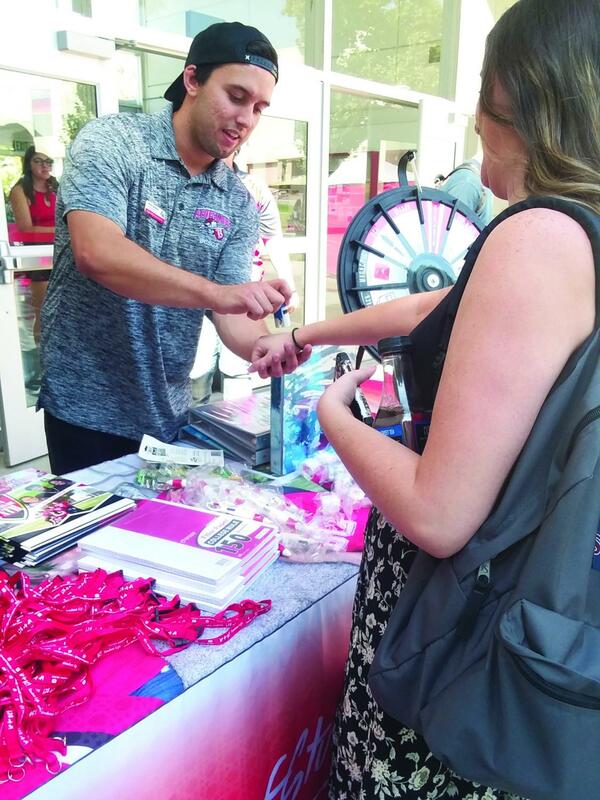 The School Supply Giveaway that took place at the crossroads on Aug. 21 gave students the chance to win free supplies at just the spin of a wheel. The student had to spin a miniature wheel and whatever slot the needle landed on, they automatically won that prize that was in the slot. 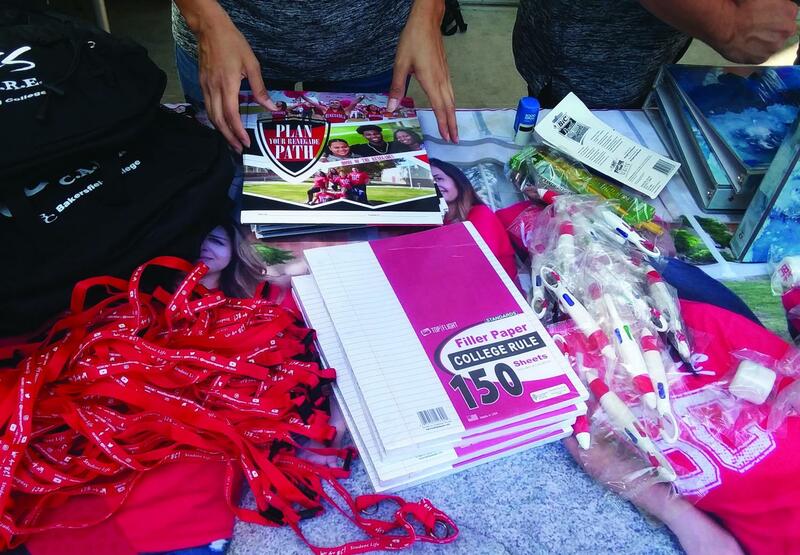 The prizes consisted of BC pens, pencils, binders, lanyards, magnets, folders, and much more. Lanyards, pens, papers and backpacks are set on the BCGSA table as possible prizes for BC students. 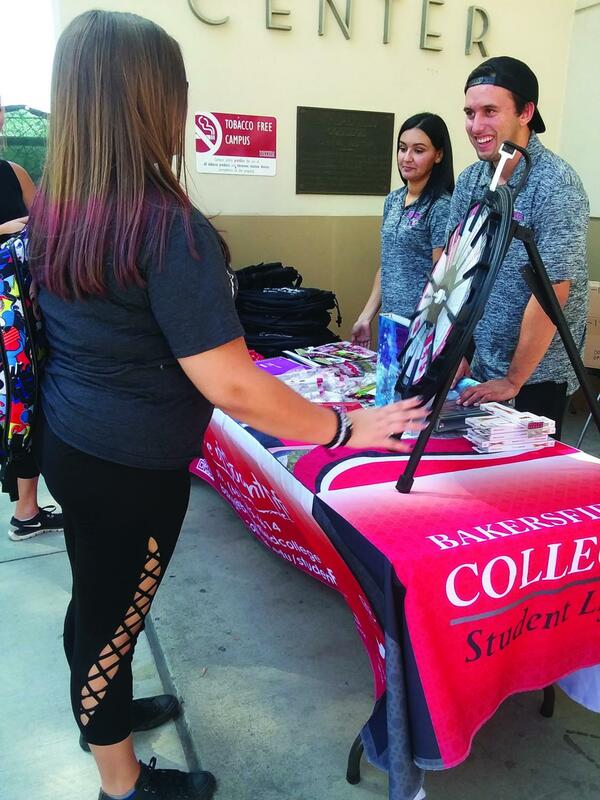 Beth Hilbe, the Director of Student Activities, ran the booth and gave away the prizes along with BCGSA members Johnny Maddon and Joanna Elizondo. “They need to see that we are here for them and that we are actively thinking about them. It’s also just good to see smiling faces and giving away free things. It helps boost [moral],” Hilbe said when asked what she hopes students take away from the giveaway other than free school supplies. Smiling faces were definitely present throughout the giveaway. Students seemed to be flattered whenever they won the big prizes such as a simple backpack. Some were even in line talking with their friends about how much they wanted to win the backpacks. A BC student gets her hand stamped by BCGSA member Johnny Maddon. The “Win Big” slot awarded the winner three prizes that were set out on the table. Whenever a student won the three prizes, people in line would cheer and clap for them. Originally, “Win Big” meant that they won a backpack from CC-1 that was full of mysterious goodies; however, they ran out of them quickly because students were dead-set on that prize. The optimism made for a lively atmosphere. It was like Hilbe was a carney at the fair watching people play a game who were in hopes to win the big prize hanging above their heads. 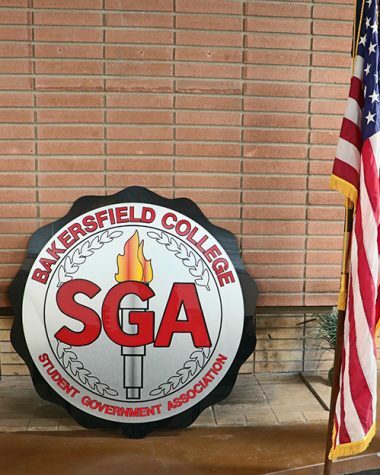 “I hope to get a lanyard and feel the school spirit,” Victoria Cortez, a student, said after being asked what she hopes to experience as she waited to spin the wheel. Joanna Elizondo and Johnny Maddon wait as a BC student takes her turn at the roulette game. The game continued on throughout the afternoon and numerous prizes were given away to lucky students. The line never seemed to die down as students kept walking up to play. Although, it was hard for them to miss the booth as they walked by because Hilbe would shout at the students for them to come join the fun. “Come spin away and win three beautiful prizes off our table,” Hilbe said. Johnny Maddon utilized his humor to add to the already optimistic atmosphere. He would always make students laugh when he asked them if they wanted their hands stamped with the “amazing” stamp, as he would put it. Making a simple stamp such a big deal caused everyone to smile despite the heat of the afternoon. 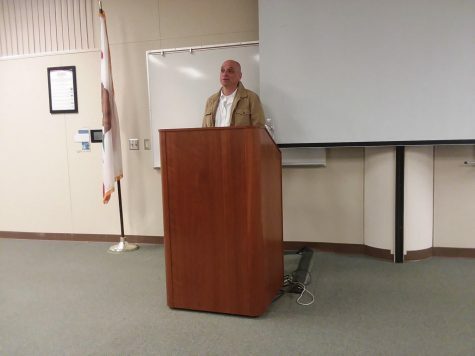 “We will have multiple events like this throughout the semester so be on the lookout,” Hilbe said.